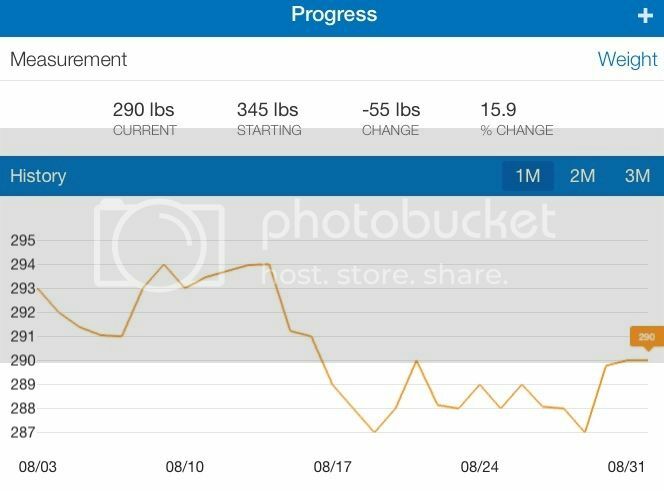 I've been doing well with getting to the gym regularly, tracking all my food, and making sure I drink enough water. Still, my weight loss is stalling - up one day, down the next, always the same few pounds. So, a few days ago, I decided to join a few other bloggers in doing a Whole 30 for September. I've tried one before, and I managed to get most of the way through it before I caved. I really, really want to be successful and finish one. Something working against me, perhaps, is that my husband does not want to participate, so I am going it alone. Not having his support will surely be a challenge - having non-compliant foods in the pantry, having to deal with being the only one following a plan when he inevitably finds an excuse to go out to eat. On the other hand, though, I don't have to worry about compliant meals - my husband doesn't cook, so as long as I am the one making the dinners, I will be making things that fit my plan. On Sunday mornings, we wake up and make our weekly menu and grocery list, then we go to the grocery store early, to beat the crazy crowds and lines that show up a little before noon. This week I announced my intention to do a Whole 30 for September, then asked for suggestions of compliant dinners that we enjoyed before. We ran our errands, then came home and I prepped my lunches for the week. 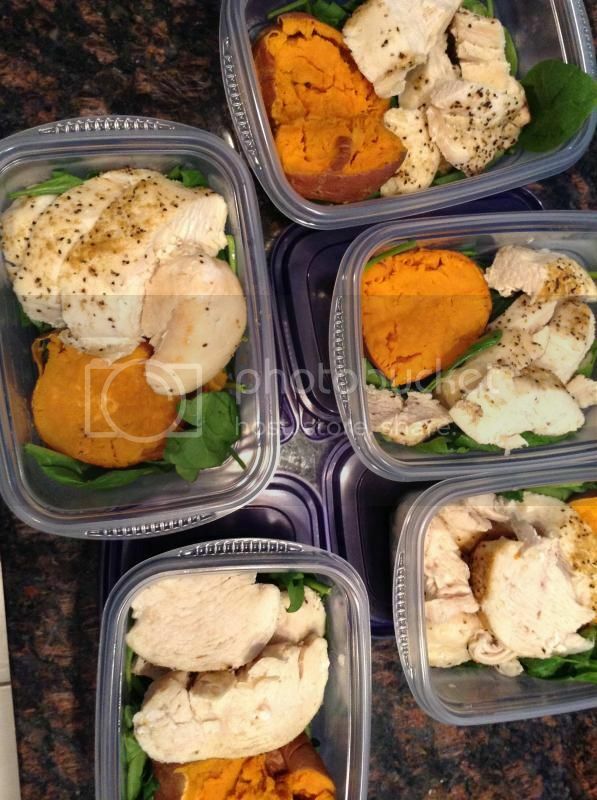 Chicken breast with a slice of sweet potato and a handful of raw spinach. I don't mind the same thing every day for a while - next week, though, I'm sure I will have to change it up a bit. This morning I made a few days worth of breakfasts too. Egg muffins, made by blending spinach and eggs (plus a pinch of black pepper and cumin). 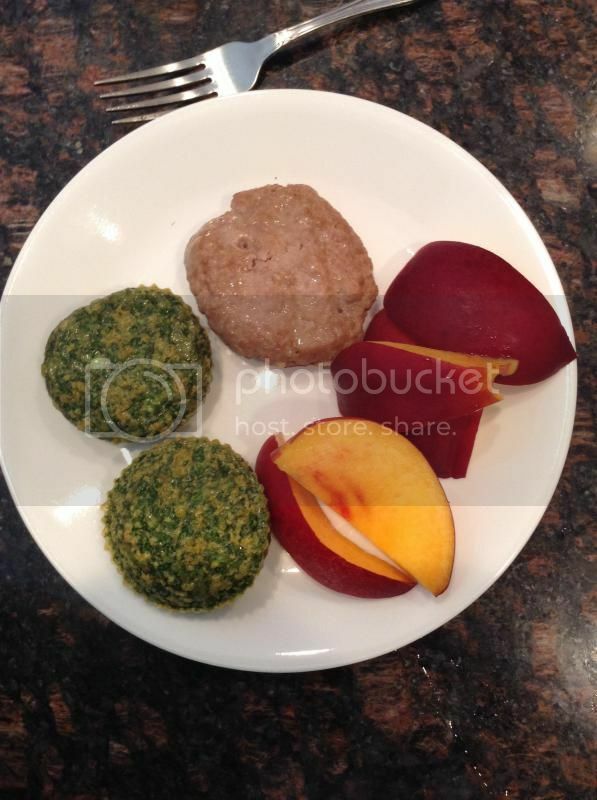 Also, a homemade turkey sausage patty, and a chopped up nectarine. Very, very good, and very filling. Since I didn't have to work today, we went to a local garden and zoo with friends of ours who have a son close to our son's age. It was a long day, and very hot - I brought a Larabar for a snack in case everyone decided to go out to eat (thank goodness for thinking ahead). I had one of my lunches when we got home, and made sure to catch up on drinking water. Dinner was roasted asparagus and a piece of a lamb steak that I split with my husband. Overall, a good first day. I don't plan on posting every meal, or even updates every day - after a few days, it gets repetitive, and a bit boring. But I'll be posting about my thoughts as the month goes by. In addition to completing a successful Whole 30, I have one other goal for September. 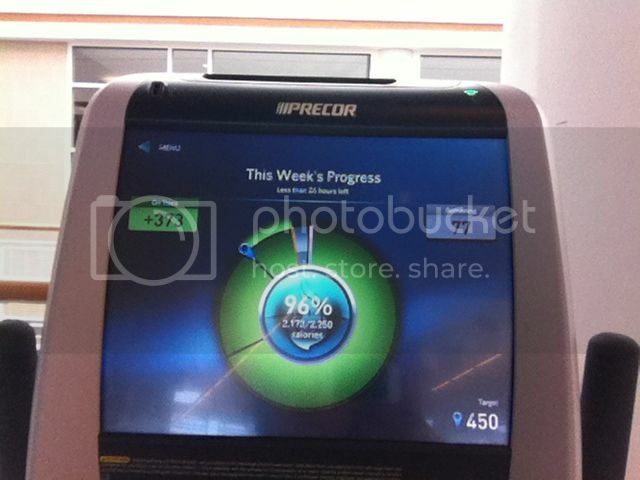 At the gym where I exercise, everyone has an account on the machines, and you can set weekly workout goals. I have a weekly goal for calories burned (2250, or an average of 450 calories if I go five times a week), and lately I have been getting pretty close to reaching it. But skipped workouts here and there have meant that I haven't hit it yet. This month, I want to hit it at least twice. That, plus the Whole 30, should put me on a good path toward making good choices consistently. It's only Day 1, but still, I'm feeling good so far. I know you can do this, Mary ! Awesome!! I just got my gym membership back and have a free month of bootcamp which starts tomorrow! I am also gearing up for another Whole 30. I won't be able to do the entire Whole 30 for the next couple of months because I have a family wedding coming up that I KNOW I will be drinking at. Instead of continuing to push the Whole 30 back, I'm going to just start doing it next week, and when I absolutely cannot avoid going off track I will try my best to stay close within the range. I know that this will be more challenging than doing an actual Whole 30, because it's so easy to 'cheat' when you're not committed to the time frame. My hope is to start an actual one late October/early November. Good luck with whole 30! I used to belong to a YMCA that had things like that, where you could log your cardio and such. I miss that. Good luck with your gym goals! Awesome job with your eating this weekend! Good luck with your Whole 30! I am glad I did mine in the spring; it definitely has helped me even in the months since, because it forced me to develop better habits. If you want to complain about it, feel free to message me :). Also, your breakfast looks delicious.